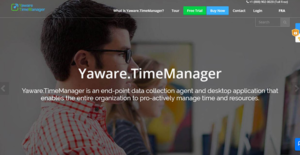 Yaware.TimeManager is a cloud-based employee time and productivity tracking software for HR managers, business owners, employees, head of branch offices, freelancers, and executives. It’s an end-point desktop application and data collection agent designed to enable businesses of all sizes to proactively manage time and resources, accelerate overall performance, and be more productive. The solution gathers data on how your employees spend time when working on your office computer and when completing task away from the office, providing a complete picture of your organization work day. Yaware.TimeManager is a multi-platform application that allows organizations to track the time spent on projects, monitor internet and software use, evaluate & recompense achievements, and control flexitime & overtime. Some of its key features include automatic time capture, mobile time tracking, expense tracking, online/offline time tracking, and employee database. Yaware.TimeManager is expertly designed to help employees and teams manage time effectively, reach goals faster, and achieve higher productivity. The solution allows you to analyze everything from internet & software use, employee time & attendance, overtime, flexitime, and more. It precisely measures and gathers all the details you need to monitor employee productivity in one place. Its multi-platform nature means it can run flawlessly on Windows, Mac OS, Linux, Android, and iOS devices. This enables you to check data and organize time wisely whether you are in the office or on the go. The solution permits you to track time automatically, categorize work time, generate smart reports, and respond to mobile & email notifications anytime, anywhere. Yaware.TimeManager is engineered to categorize work time either as productive, unproductive, or neutral. The categorization makes it easy to pinpoint where prioritizing & scheduling require special attention, identify where work time is lost, define the least and most productive office hours, and realize the most effective work/rest balance. It promotes high efficiency while closing the productivity gaps to enable your business to achieve more in less time. In addition, Yaware.TimeManager productivity analysis delivers insightful productivity ratings. The ratings empower your business to build closely knit teams and bring managers up to speed with their subordinates. They encourage healthy competition and facilitate productivity growth and further advancement. Better still, the objective productivity data promotes effective time management and self-improvement among your employee. The solution allows you to set attainable yet challenging targets for your employee. When these goals are achieved, it becomes easier to acknowledge employee achievements and implement fair compensation. If you are considering Yaware.TimeManager it might also be sensible to check out other subcategories of Best HR Software gathered in our base of B2B software reviews. Every enterprise is different, and may need a specific HR Software solution that will be adjusted to their company size, type of clients and employees and even particular industry they support. We advise you don't count on locating an ideal services that is going to be suitable for every business no matter what their background is. It may be a good idea to read a few Yaware.TimeManager reviews first and even then you should remember what the solution is supposed to do for your business and your staff. Do you need an easy and straightforward service with just basic features? Will you really make use of the advanced tools required by experts and large enterprises? Are there any particular tools that are especially practical for the industry you work in? If you ask yourself these questions it is going to be much easier to find a solid service that will fit your budget. How Much Does Yaware.TimeManager Cost? We realize that when you make a decision to buy HR Software it’s important not only to see how experts evaluate it in their reviews, but also to find out if the real people and companies that buy it are actually satisfied with the product. That’s why we’ve created our behavior-based Customer Satisfaction Algorithm™ that gathers customer reviews, comments and Yaware.TimeManager reviews across a wide range of social media sites. The data is then presented in an easy to digest form showing how many people had positive and negative experience with Yaware.TimeManager. With that information at hand you should be equipped to make an informed buying decision that you won’t regret. What are Yaware.TimeManager pricing details? What integrations are available for Yaware.TimeManager? If you need more information about Yaware.TimeManager or you simply have a question let us know what you need and we’ll forward your request directly to the vendor.